Doctors and nurses are experts and they need to absorb complex information under stressful conditions. The Streams app provides real-time alerts and information, pushing the right information to the right clinician at the right time, so they can provide the best possible care. Streams was rolled out at the Royal Free Hospital in early 2017 and is already receiving very positive feedback from clinicians and patients. 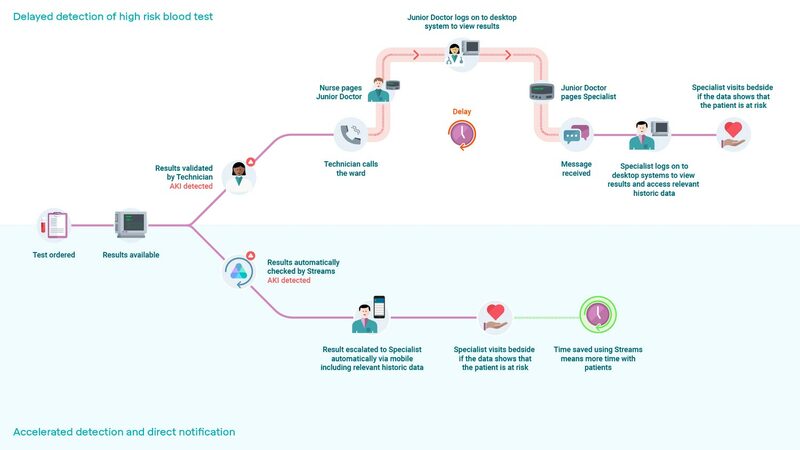 ustwo has been DeepMind’s design partner on the Streams project, using simulated data (as opposed to real patient data) to scope out, design and implement important features. Designing tools for clinicians in a hospital environment presents specific challenges – presenting complex data under the highest security standards, considering edge cases and incorporating medical terminology. It involves understanding the intense daily pressures that clinicians are under as they save lives, and ensuring the product supports and empowers them in their work to improve patient safety. Streams operates in a highly regulated environment and is CE marked as a medical device. Read more about Streams here. Note: All data shown in imagery is simulated. ustwo have been fantastic partners for Deepmind Health. They very quickly embedded within our team, internalised our culture and delivered excellent results. It's so rare to find a team that is so flexible and can integrate so well so quickly. We are passionate about the potential of digital technology to transform health care. Are you keen on making a meaningful impact? Interested in joining the ustwo team? Sign up to get fresh and regular(ish) ustwo thinking direct to your inbox.